What a way to kick off the first day of SourceCon Atlanta. Holly Mallowes enters the stage and is ready to share how everyone can become their own sourcing machine. Eager to listen and prepared to take copious notes; I sat right up front because I didn’t want to miss a single thing. You all will be provided a mere glimpse into the long list of tools that she shared with us. She captivated the crowd with her transparency and humor as she confessed when she was asked to speak on growth hacking that she had to Google the term to find out what it meant. 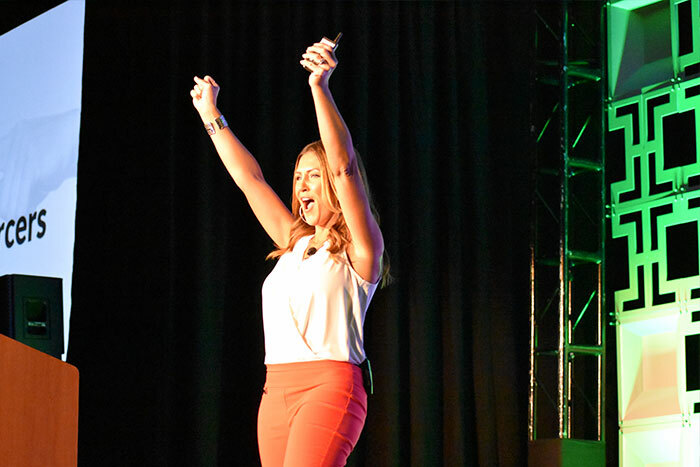 Had she not mentioned it, we never would have known because her keynote was filled with several actionable takeaways for any sourcer ready to trek their path on a growth hacking journey. One of the first tips shared by Mallowes was a simple way to get thousands of emails in minutes from LinkedIn for FREE. How is this possible one might ask? Mallowes explained that she asked her hiring managers for permission to get contact information for all of their first level connections on LinkedIn. This was all voluntarily of course. Mallowes said that she downloaded the information into a CSV file and ended up with over 100,000 lines of data. These results were astonishing! Her next steps were to remove any duplicates. After this was completed; Mallowes had a list of 31,425 names that were not in their company database. Wow! So what are you waiting for? Get to it – start asking for those first level connections and up of your name generation game, after you finish reading this – of course. If that wasn’t enough for you. Mallowes shared with us another favorite of hers. This one is called answer the public. It’s a site where you can type in any keyword, and this guy will suggest questions and content ideas within seconds. Results can also be downloaded to a CSV file. For example, I typed in the word Dentist, and within seconds I was able to see 191 different questions. There is the option to see the results as a visualization or data list. Need more keyword alternatives? Mallowes shared another site called keyword shitter. You can type a keyword and once you hit enter; within seconds there are thousands of keywords generated associated with the one entered. To test this, I used Dentist as a keyword, and then instantly the screen filled with keyword phrases related to the word Dentist. Mallowes demonstrated another tip using Google images to growth hack additional names. In this example, I did a Google search for General Dentists in Bossier City, LA. Once the results loaded, I clicked on the tools drop down menu and selected the image and face option. This allowed for photos, mostly headshots of Dentists in the area along with the source where the photo had been used online. I randomly clicked on one of them and was taken to the “meet our team” section of a dental practice. This site happened to be for a group of practices in the Bossier City area that has 11 practicing Dentists. Talk about a quick growth hack. There were other tools Mallowes mentioned such as Hiretual, Seekout, and Hunter. The variety in her growth hacking tips left capacity for anyone there to leave the auditorium and be able to execute on their own. She flawlessly delivered a keynote that was engaging, informational, and relatable. If you ever get the chance to hear her speak, you won’t be disappointed. You are for sure going to walk away with new knowledge and skills to become a better sourcer. Overall, listening to Mallowes speak about growth hacking gave me a fresh perspective on how to become my own sourcing machine. I hope that you will give some of these tips a test run for whatever industry you recruit or source for as well. That’s what learning is about; take the information in and then execute. Otherwise, we will never advance in this ever-changing world of sourcing and recruiting.